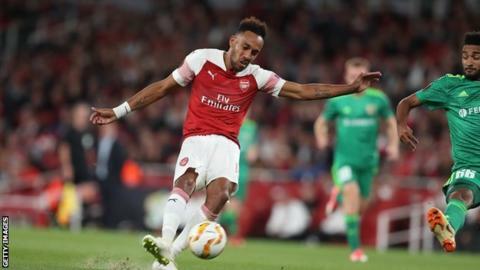 Pierre-Emerick Aubameyang scored twice as Arsenal opened their Europa League Group E campaign with a comfortable win over Ukrainian side Vorskla Poltava. Until Aubameyang's opening goal it had been a laboured performance from the Gunners, who had struggled to break through well-drilled opponents. However, the Gabon striker - the club's record £56m signing last January - changed the dynamics of the contest by steering Alex Iwobi's pass into the bottom left corner after the visitors overcommitted in attack. It was only Aubameyang's sixth touch of the game, and Arsenal's first shot on target but it allowed them to cut loose after the break. England forward Danny Welbeck doubled Arsenal's lead three minutes after the interval with a header from Henrikh Mkhitaryan's cross. And as Unai Emery's team surged forward, Aubameyang stroked his second goal of the night past visiting goalkeeper Bohdan Shust before substitute Mesut Ozil rounded off the scoring for the hosts. "I didn't play in the Europa League last year and I am really happy to be back in this competition," said Aubameyang. "We want to go to the final, of course - it is an objective and hopefully we will do well in our next games." At 4-0 the scoreline was cruel on Vorskla, who have had a mixed start in the Ukrainian Premier League after finishing third last term. They did, though, muster consolation goals via captain Vladimir Chesnakov's left-footed shot from 18 yards and Vyacheslav Sharpar's strike moments before the final whistle blew. In the group's other game, Sporting Lisbon beat Azerbaijani side FK Qarabag 2-0. Despite making eight changes to his line-up, Arsenal manager Emery was still able to select an XI brimming with international players as he racked up his 32nd win in the competition, more than any other manager in the Europa League. There were first starts for Uruguay midfielder Lucas Torreira and Switzerland full-back Stephan Lichtsteiner, while Germany goalkeeper Bernd Leno made his debut. The inclusion of Torreira, a £26m signing from Sampdoria, and Leno, a £19.2m acquisition from Bayer Leverkusen, also served to underline the disparity in resources available to each manager. Vorskla manager Vasyl Sachko's squad has a combined value of about £11m and even at near full strength he could only field four senior internationals - two from Ukraine and one from Georgia and Armenia. "We are giving chances to many players to find confidence," Emery told BT Sport. "We need to because we are going to play a lot of matches and need to give minutes to players. I want to continue to be competitive in each match. Some players are better when they are playing regularly." While Spaniard Emery deployed a more cosmopolitan side, he was also afforded the luxury of handing a senior bow to a homegrown player, Emile Smith-Rowe. An Under-17 World Cup winner with England last October, Smith-Rowe is highly regarded at the club's London Colney training ground. And the 18-year-old attacking midfielder did enough in a 20-minute cameo to suggest he may be given further chances, intercepting a Vorskla attack with his first touch and going on to show a willingness to get hold of the ball. Vorskla may have started their evening defiantly and ended it with the final flourish of two goals but the gulf in class and experience told in between. There was also a sense the visiting players let the occasion get to them once their concentration had been disrupted by Aubameyang's first goal. The Poltava club have only ever faced British opposition once before in Europe, in the form of Northern Irish side Glentoran. And the draw of Arsenal led the club to set up a fan-zone with a big screen at their stadium in central Ukraine to allow their supporters to witness arguably the biggest night in their history. However, hopes of an upset quickly disappeared when Arsenal took advantage of a naive slip in the visitors' defence to open the scoring. Having stuck rigidly to a gameplan focused on stifling the Gunners, Vorskla pushed six players forward and left a huge hole in midfield that the hosts ruthlessly exposed - with Emery's side breaking at speed after a failed dummy presented possession to them. While Vorskla were appearing in only their second Europa League campaign since the competition reformed in 2009-10, Arsenal continued in the same vein as last term when they scored 30 goals in 14 games to reach the semi-final. Arsenal manager Emery recorded his 32nd victory in the Europa League in this game; the most of any manager in the competition's history. Arsenal have lost just one of their last 13 home games in the Europa League/Uefa Cup (W9, D3), with that only defeat coming against Ostersunds FK in February (1-2). Vorskla remain without a win in the Europa League, having drawn two and lost five of their seven games in the competition. Arsenal's six games in all competitions in 2018-19 have seen a total of 25 goals scored (14 for and 11 against), at an average of 4.2 per game. In the Europa League and Champions League combined (excluding qualifiers), Arsenal striker Aubameyang has netted 21 goals in his last 25 appearances. Aubameyang has been directly involved in 12 goals in 10 appearances for Arsenal at the Emirates Stadium (nine goals and three assists). Arsenal midfielder Alex Iwobi has either scored or assisted in each of his three appearances under Emery (one goal and two assists). Arsenal have a two-week break before their next Europa League fixture against FK Qarabag on 4 October (17:55 BST). The Gunners resume their Premier League duties at the Emirates on Sunday when they face Everton (16:00 BST). Match ends, Arsenal 4, Vorskla Poltava 2. Second Half ends, Arsenal 4, Vorskla Poltava 2. Goal! Arsenal 4, Vorskla Poltava 2. Vyacheslav Sharpar (Vorskla Poltava) right footed shot from outside the box to the bottom left corner. Assisted by Pavlo Rebenok. Offside, Vorskla Poltava. Nicolas Careca tries a through ball, but Mykhaylo Sergiychuk is caught offside. Corner, Arsenal. Conceded by Igor Perduta. Mesut Özil (Arsenal) wins a free kick on the left wing. Foul by Mykhaylo Sergiychuk (Vorskla Poltava). Corner, Arsenal. Conceded by Artur. Attempt blocked. Emile Smith-Rowe (Arsenal) left footed shot from the left side of the box is blocked. Assisted by Mesut Özil. Matteo Guendouzi (Arsenal) wins a free kick in the defensive half. Foul by Henrikh Mkhitaryan (Arsenal). Igor Perduta (Vorskla Poltava) wins a free kick on the right wing. Foul by Matteo Guendouzi (Arsenal). Yuriy Kolomoets (Vorskla Poltava) wins a free kick in the attacking half. Corner, Arsenal. Conceded by Vladimir Chesnakov. Substitution, Vorskla Poltava. Mykhaylo Sergiychuk replaces Aleksandr Kobakhidze. Goal! Arsenal 4, Vorskla Poltava 1. Vladimir Chesnakov (Vorskla Poltava) left footed shot from the centre of the box to the top left corner following a set piece situation. Nicolas Careca (Vorskla Poltava) wins a free kick on the left wing. Substitution, Vorskla Poltava. Nicolas Careca replaces Vladyslav Kulach. Goal! Arsenal 4, Vorskla Poltava 0. Mesut Özil (Arsenal) left footed shot from the left side of the six yard box to the centre of the goal. Assisted by Stephan Lichtsteiner. Corner, Vorskla Poltava. Conceded by Emile Smith-Rowe. Substitution, Arsenal. Emile Smith-Rowe replaces Alex Iwobi. Substitution, Vorskla Poltava. Aleksandr Sklyar replaces Dmitry Kravchenko. Attempt missed. Vladimir Chesnakov (Vorskla Poltava) right footed shot from outside the box misses to the left. Assisted by Vladyslav Kulach. Attempt missed. Yuriy Kolomoets (Vorskla Poltava) header from the centre of the box misses to the left. Assisted by Artur with a cross. Foul by Rob Holding (Arsenal). Vladyslav Kulach (Vorskla Poltava) wins a free kick on the right wing. Attempt blocked. Alex Iwobi (Arsenal) right footed shot from the centre of the box is blocked. Assisted by Mohamed Elneny. Mesut Özil (Arsenal) wins a free kick in the attacking half. Foul by Vyacheslav Sharpar (Vorskla Poltava). Foul by Mohamed Elneny (Arsenal). Aleksandr Kobakhidze (Vorskla Poltava) wins a free kick in the defensive half. Substitution, Arsenal. Matteo Guendouzi replaces Lucas Torreira. Substitution, Arsenal. Mesut Özil replaces Pierre-Emerick Aubameyang. Goal! Arsenal 3, Vorskla Poltava 0. Pierre-Emerick Aubameyang (Arsenal) right footed shot from outside the box to the bottom right corner. Assisted by Henrikh Mkhitaryan. Hand ball by Alex Iwobi (Arsenal). Attempt missed. Pierre-Emerick Aubameyang (Arsenal) right footed shot from the centre of the box is too high. Assisted by Alex Iwobi with a cross.